Cassidy Watton to me in her own right embodies the term “Badass Woman of OCR”. She is all about training hard, playing hard and not taking herself too seriously in life. Cassidy has quite the impressive OCR race resume, including a number of podium placements, and she is currently the season 3 and 4 defending champion of the Steve Austin Broken Skull Challenge. When putting this article together, it was nice to see that like all of us, Cassidy struggles with mental toughness during her training –a skill that takes many years to perfect. It’s not easy being on longer tougher courses, so I found this very relatable to my own training. I was very excited when she agreed to do this interview for Mud Run Guide, and from what her friends tell me, she is not only a hard-working badass, but she is full of life and loves to have fun. I was playing sports from the moment I could walk–basketball, softball, soccer-any sport my mom could register me in. In High school I focused on basketball but did cross country and track to stay in shape for basketball. In college my focused turned more towards fitness in general. After college I became a personal trainer and group fitness instructor while simultaneously getting involved in OCR. About two years ago I began working at Epic Hybrid Training, and my career focused turned completely towards group fitness and HIICT (High Intensity Interval Circuit Training). About this same time, I joined the Spartan Pro Team and have been a member for two years. What was your first OCR? How did you know you were hooked? I got 6th place in my first Spartan Race with no idea what I was getting into. After that, I was on the podium for my next several races and knew I found something I was pretty good at so I had to see how far I could go with it. What has been your proudest achievement on course so far? Holding the fastest time for a 1/2 mile obstacle race on the show, Steve Austin's Broken Skull Challenge. I am the current champ of two seasons and will go back to defend my title this summer. As far as Spartan Racing, I am most proud of some of my top finishes in sprint courses (where I thrive) particularly my wins/podiums in MANY Stadium Races as well as OCR World Champs 2014 Short Course win. What is your one bucket list race? I haven't really thought about it but I'd like to do some Adventure Races in the future. Is there a race you won't do? I have no interest in running a straight up Marathon. 26 miles on pavement- no thanks. As an athlete what challenges do you face on / off course and how do you overcome them? As an athlete, injuries are always a challenge on and off the course. I am d ealing with an overuse injury right now and it’s tough to decide when to take it easy, which races to skip, etc. I face it by trying to be as smart as possible and usually learning from my mistakes. What's the weirdest thing you bring with you on each course? I don't bring anything with me unless the race is going to take over 90 minutes. In that case it’s just food and water. Is there one weak point that you are constantly trying to overcome in your training? The thing I try to always improve is my confidence and mental toughness. We all know how to train at this level, but it's all about who can put it together on race day. Do you believe that OCR as a sport has developed into more than just a community of getting muddy? Yes, OCR has developed into a diverse community of both elite athletes and people who race for all different sort of reasons. Like anything else, communities are always formed with like-minded people doing the same thing. What's one little known fact you'd like to share about yourself? At from 18-28 years old (present) I've lived in 5 states and 2 countries. Is there a piece of advice that you have learned on course that you can give that applies to day to day life? You always have a little more in the tank than you think you do and you'll pass out before you die. Physically and emotionally in life. 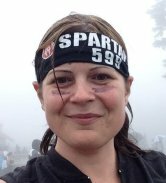 In the OCR community who inspires you and why? Any women who are racing competitively who have birthed children!! Especially women who have more than 1 kid and are still beating me! You're awesome! Do you feel you have natural talent to do as well as you do in events or is it due to your dedication and training? I think it is equal parts natural talent and hard work. If I didn't have the natural talent, hard work wouldn't get me where I am. Some people can do the same exact workouts as me every day and never beat me AND I can do the same workouts as someone who is better than me and never reach their level if they have more natural talent than me. It's not the popular or encouraging answer but it is true. Hard work alone doesn't win races. What's the scariest experience you've experienced on course?! During the NJ beast this year around mile 10 I was completely depleted and running downhill. There is no way I was going to pull out so I thought to myself “well, if I pass out hopefully I just won't hit my head”. I ended up eating some food I had with me (but did not want to eat at all) and was fine and took 3rd. If someone wants to reach out to you on social media how can they reach you?